Knicks’ Power Forward Amar’e Stoudemire plans on returning if the Knicks make it to the second round of the playoffs. Stoudemire missed the first 2 months of the season before returning in January. 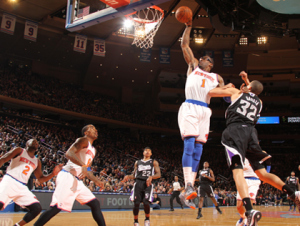 After a slow start, Amar’e got his confidence and explosiveness back and started being a force inside for the Knicks. But injury struck again, and Stoudemire has been out since early March. It has been 6 weeks since his surgery… his timetable was 4-6 weeks. If everything goes great [with rehabilitation], then I’m willing to play. Sooner than later, hopefully, if everything continues to improve…. Everything’s on schedule for the most part. I’ve got to continue to get stronger, got to get back on the court, start moving around at full speed…. And if I can handle that, then we go up a notch, that’s great. Then I’m looking [forward to] hopefully playing soon. We’ll see… If we continue to win, then that gives me more time to really heal up 100 percent. So that’s kind of the blessing that we have right now. This entry was posted in Articles and tagged amar'e, amar'e stoudemire, KNICKS, KNICKS MEMES, Knicks news, Knicks Playoffs, stoudemire, stoudemire return on April 26, 2013 by Tommy Rothman.